All of these woods were salvaged in Winnipeg, Manitoba. All the wood colors are natural!!! 2. Wood from an old banana holder stand. Amur Cherry Wind fall tree found on my street in Winnipeg Manitoba. Amur cherry, also known as Manchurian cherry, has bronze coloured papery bark that sheds. It is species of cherry native to Korea, northeastern China and southeastern Russsia. Apple Arborist tree removal, Winnipeg, Manitoba. Ash 1. Wood from discarded hardwood pallets from CARTE INTERNATIONAL INC, Winnipeg, Manitoba. Austrailian Lacewood Guitar maker scraps, Glen Bergman (Luthier), Winnipeg www.bluebirdguitar.comThis tree is native to Northern Austrailia where it is known as silky oak. Bamboo Old wooden box found at local Thrift store in Winnipeg. Burr Oak Arborist tree removal, Winnipeg, Manitoba. 2. Wood from discarded hardwood pallets from CARTE INTERNATIONAL INC, Winnipeg, Manitoba. A gift from a friend. This wood comes from another wood reclaim company: Wood Anchor. They have a deal with the city to salvaged Elms that are being cut down or thinned. Winnipeg. French Oak Scraps from an organ that was removed from a cathedral in France and is estimated to be 200-300 years old. This wood was given to me by a local Winnipeg, Manitoban Luthier. Hickory Scraps from a local Winnipeg, Manitoba kitchen cabinet manufacturing shop. Indian Rosewood Old wooden box found at local Thrift store in Winnipeg. Indonesian Mahogany Wood from discarded hardwood pallets from CARTE INTERNATIONAL INC, Winnipeg, Manitoba. 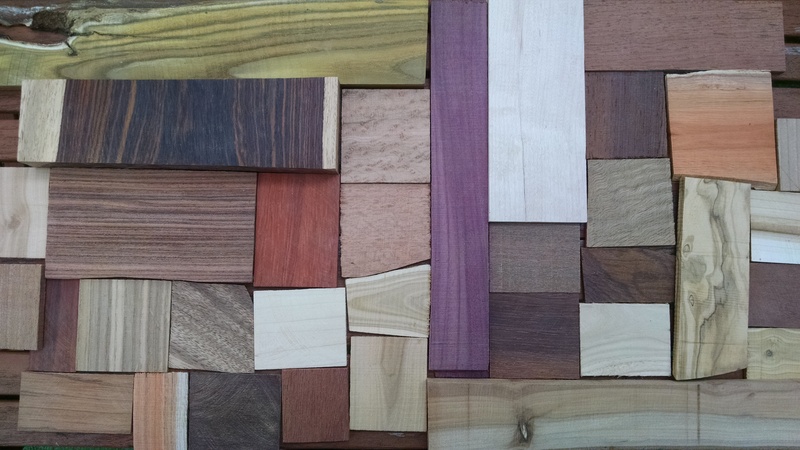 Jatoba(Brazilian Cherry) Scraps and offcuts from Dynasty Flooring, Winnipeg, http://dynastyflooringcanada.comAlthough Jatobá is sometimes referred to as Brazilian cherry or South American cherry, it is not a cherry tree but a legume belonging to the Fabaceae family. It is a tree common to the Caribbean, Central, and South America. Lauan Wood from discarded hardwood pallets from CARTE INTERNATIONAL INC, Winnipeg, Manitoba. Maple 1. Wood from discarded hardwood pallets from CARTE INTERNATIONAL INC, Winnipeg, Manitoba. Massaranduba Scraps and offcuts from Dynasty Flooring, Winnipeg. Dynasty Flooring, Winnipeg http://dynastyflooringcanada.comAlso known as Bulletwood and Brazilian Redwood. It is extremely dense and hard. Mountain Ash 1. City Tree removal, Winnipeg, MB. 2. Scraps from a local Winnipeg, Manitoba kitchen cabinet manufacturing shop. Olive wood Old wooden dish found at local Thrift store in Winnipeg. Arborist tree removal Winnipeg, MB. Old wooden plaque found at local Thrift store in Winnipeg. Scraps from a local Winnipeg, Manitoba kitchen cabinet manufacturing shop. Red Oak Wood from discarded hardwood pallets from CARTE INTERNATIONAL INC, Winnipeg, Manitoba. Siberian Elm City Tree removal, Winnipeg, MB. Staghorn Sumac Arborist tree removal Winnipeg, MB. I got a pair of your earrings to give as gift while on the west coast this past summer. Have you worked with arbutus wood?It is such a stunning tree, and some times I find broken branches.